Toyota has substantially raised the bar with the release of an updated HiLux range that improves value by as much as $8,340 or 15.8 per cent. New styling and added features across the range plus reduced prices on many of the 35 HiLux variants have put Australia's top-selling utility in an even stronger position. 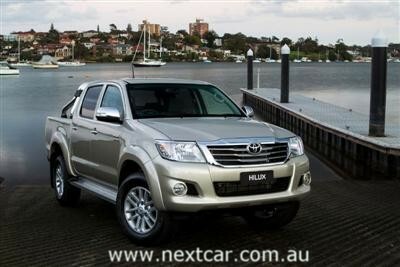 Every 4x4 HiLux provides between $1,960 and $8,340 better value while 4x2 HiLux delivers enhanced value of up to $1,640. Toyota Australia's senior executive director sales and marketing David Buttner said the added specification and aggressive pricing would further strengthen HiLux's grip as Australia's most popular commercial vehicle. "We have continually updated HiLux so that it offers the size, body styles, power, equipment and value demanded of a vehicle that doubles as a workhorse and a family car," Mr Buttner said. HiLux improvements begin with new sheet metal from the A-pillar forward - a new bonnet, radiator grille, headlamps and front bumper. The profile has been further enhanced for SR5 models with newly designed mudguards, new door mirrors with integrated turn signals and redesigned wheels (4x4 Xtra and Double Cabs). Across the range, anti-skid brakes are now standard and cruise control is standard on all SR and SR5 variants, as well as automatic 4x4 WorkMate. All models now have a tachometer. In the 4x4 range, vehicle stability control is now standard on all SR5 double cabs and optional on all SR Double Cab utilities. Side seat and curtain-shield airbags and sports-style front seats have been fitted to all 4x4 SR5 and SR variants. A limited-slip differential has been included in all 4x4 WorkMates. Toyota HiLux interiors have been updated with refined designs that reinforce its credentials as a leisure vehicle, including new seat fabrics on selected variants. It offers improved sensory quality throughout the cabin and almost passenger-car levels of convenience. A new upper dashboard design features a horizontal centre instrument cluster that reinforces the breadth and roominess of the cabin. The 'centre stack' features new controls for the heating and ventilation system and, for SR5 variants, automatic climate control has been added to the air-conditioning. 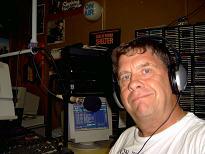 A major improvement is the addition of advanced new audio systems on all variants. Depending on the grade, they feature voice recognition, touch screen, radio text, 3D graphics for the satellite navigation and safety warnings for school zones and speed and red-light cameras. As part of these audio upgrades, all SR5 models will come with satellite navigation as standard, viewed on the 6.1-inch LCD touch screen. Toyota's HiLux range now starts with the 4x2 WorkMate Single Cab cab-chassis at $18,990* - an increase of just $500 offset by the addition of anti-skid brakes, a tacho, new sheet metal, redesigned interior and a new audio system. Across the range, the biggest improvement in value comes with the 4x4 SR5 turbo-diesel Xtra Cab. The added spec - including satellite navigation, dusk-sensing headlamps, steering wheel-mounted telephone controls, re-designed alloy wheels, sports-style front seats with side airbags, curtain-shield airbags and auto control for the air-conditioning - comes to $2,690. In addition, the price has been rolled back by $5,650. 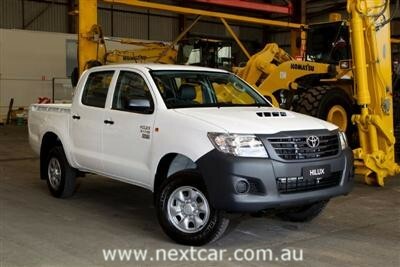 The entry price for a 4x4 turbo-diesel HiLux has come down $6,150 or 16.1 per cent to $31,990* with the introduction of a WorkMate Single Cab with manual transmission. Its feature list includes ABS, driver and passenger airbags, tacho, limited-slip differential, 16-inch wheels and protective covers for the engine and fuel tank. 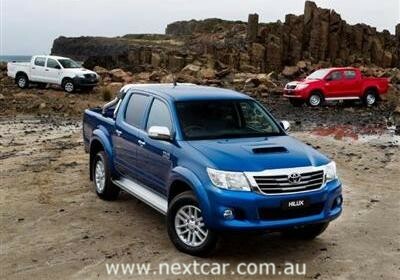 HiLux 4x4 Xtra and Double Cabs are once again priced from under $40,000*. The 4x4 Xtra Cabs start at $38,490* for the SR turbo-diesel cab-chassis - an overall improvement in value of $5,840 that includes additional equipment of $1,290 and a price cut of $4,550. 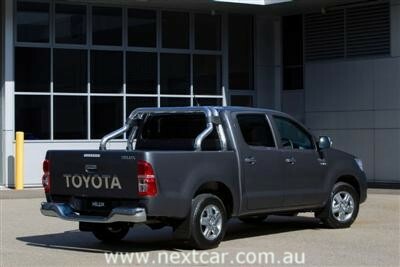 Toyota has also introduced a new SR Xtra Cab utility at $39,990*. For 4x4 Double Cabs, a new turbo-diesel WorkMate utility once again brings the entry price under $40,000* - at $38,990* for the manual transmission version. This is $5,900 less than the previous lowest-priced diesel Double Cab. 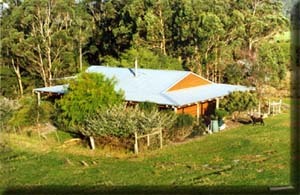 All other 4x4 Double Cabs have had price reductions - from $200 to $3,650. With the changes, the HiLux range has been expanded from 32 to 35 variants - 17 4x2s and 18 4x4s. Toyota HiLux now comes with the choice of three cabins - Single, Xtra and Double Cab; two styles - utility and cab-chassis; three equipment grades - WorkMate, SR and SR5; three engines - 2.7-litre four-cylinder petrol, 4.0-litre V6 petrol and a 3.0-litre four-cylinder turbo-diesel; the choice of two-wheel drive and four-wheel drive; and manual or automatic transmissions.